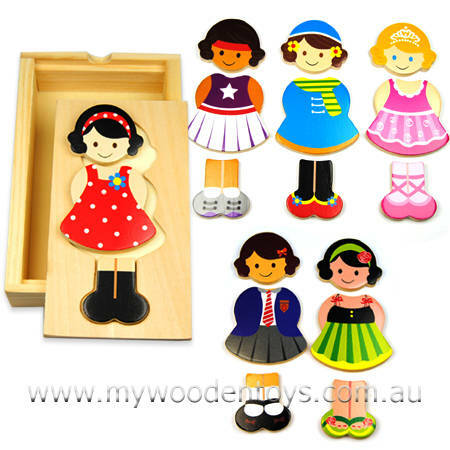 Dress Up Girl Puzzle is a sweet little take anywhere toy. The puzzle comes in a wooden box with a recessed lid. The recess is in the shape of a girl and fits the puzzle pieces. The little girl can be arranged with a different head, body and legs. There are six versions of the little girl all with three pieces so there are many possibilities to change her outfits. The box's sliding lid stores all the pieces nicely, making this a great toy to take with you on trips out. We like this because: "Sweet toy that keeps little ones occupied changing and re-changing heads, clothes and feet."